What is the TN/VA Scholar Program? Tennessee/Virginia Scholars, a program of the Kingsport Chamber, is a regional rewards and recognition program for high school students sponsored by local business and industry. TN/VA Scholars are high school students who have completed the TN/VA Scholars course of study requirements, and volunteer requirements. Part of being a TN/VA scholars students must have 80 hours of volunteer work. To learn about volunteer opportunities go to the DB Counseling page and click on the Volunteer Opportunities Link. To log your volunteer hours please use the TN/VA Scholars Community Hours Form log form. To learn about the requirements to become a TN/VA Scholars. 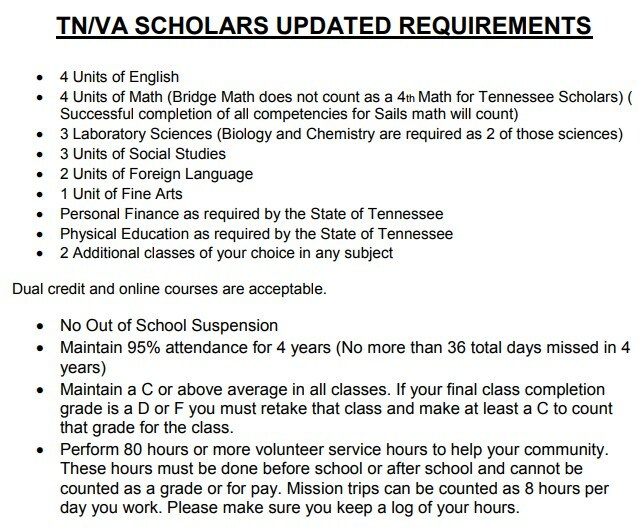 Please click on the TN/VA scholars website and look at the requirements. Seniors, please remember to submit your TN/VA Scholars volunteer hours to the Counseling office by January 11, 2019.